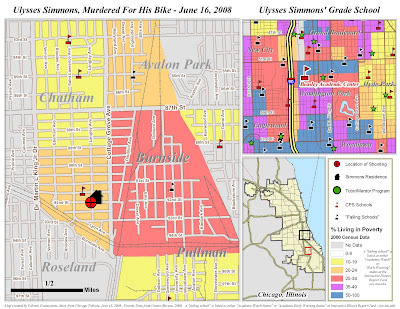 Last week the Chicago Sun Times reported that a young man - 14 years old - was shot on the far South Side. It was the first day of summer vacation -- cool, not too hot -- a perfect day to hang out with buddies on the block and flirt with the girls. That's what 14-year-old Ulysses Simmons was doing Monday, friends said, when a white car circled the South Side block for the third time, disappearing around the corner. As they scattered, one 14-year-old boy was shot in the shoulder. Friends said Ulysses, who had been sitting on his beloved bike talking to one of the girls, fell to the ground, clutching his stomach. The Burnside boy, an eighth-grader at Beasley Academic Center, was mechanically inclined -- he could fix almost anything around the house and on the car, even radios and computers, his grandmother said. He is the first Chicago Public Schools student slain over the summer break. Not gang-banging. Not causing trouble. A smart kid with a supportive family and a bright future, shot in a high-poverty neighborhood for his bike. 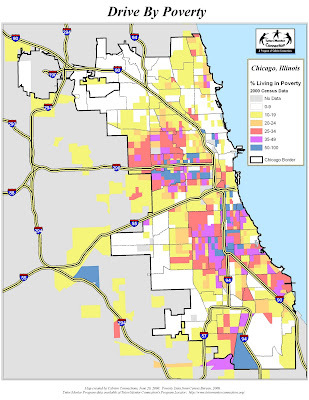 Unfortunately, anyone who has been within earshot of the news this summer knows that Ulysses' story is all too common, and that kids in Chicago are being killed at an unprecedented rate this year. 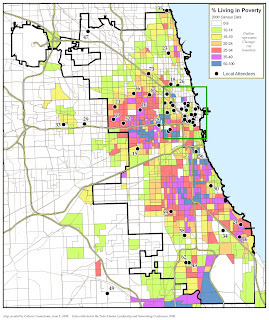 T/MC maps will show the degree of poverty and locations of poorly performing schools in neighborhoods where the media point their bad news spotlight. 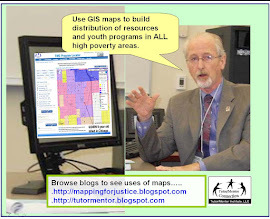 The maps also will show locations of volunteer based tutor/mentor programs, if any exist. For instance in the map above, there are no volunteer based tutor/mentor programs (that we know of) in the neighborhood where the shooting took place, and only a few in the area around the school this boy attended. In essense, these maps will try to fill in gaps - a supplement, if you will - to the news outlets who provide the stories. A common theme we'll be developing is, "Where are the resources in our city where volunteers and donors can lend a hand?" Hopefully these maps will also serve as a visual directory of resources/institutions (churches, banks, businesses, schools, hospitals, etc.) that can work side by side with new and existing Tutor/Mentor Programs to help mend the poverty gap, reducing the frustration and hopelessness that occasionally lead to anger and violence. And lastly, the maps will attempt to show just how easy it can be for people to exit the highway and volunteer their services for a few hours each week. As we've seen recently, one has to look no further than Cabrini Connection's year-end dinner to see how normal working people - people who commute daily through high-poverty neighborhoods - can make a difference in kids' lives. Recently I heard a good question posed. "Why in the world would anyone want to get off the highway and go into a high-poverty neighborhood where there is frustration and potential violence?" (As though there are entire neighborhoods of muggers and gangbangers just waiting for someone to wander off the highway.) This is probably a common fear for potential volunteers who, ironically, are victims themselves of the hypersegragation that poverty has created among all Americans, and who share more common interest than difference when you strip away the ignorance that comes from not knowing someone. 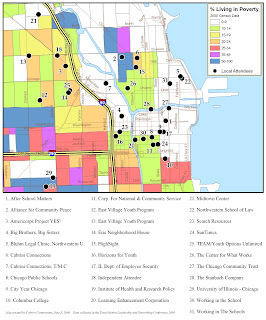 Fact is, there are people working in these neighborhoods - in schools and churches and businesses and tutor/mentor programs who recognize that the future of the city - our economy and our well-being - can be positively affected by helping all kids become better-educated leaders. In fact, one might argue that there is more risk in NOT spending a few hours each week getting to know these kids and their families - ultimately shedding ignorance for ALL parties, and mentoring future leadership. (This, again, is what many volunteers at Cabrini Connections rave about when asked about the experience. Many have been quoted at saying that they may be taking more out of it than the kids.) 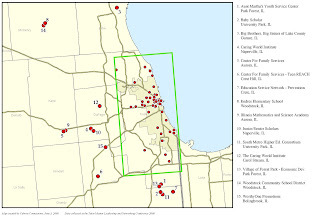 What these maps will eventually do is show the different groups and resources working in Chicagoland to fight poverty. I welcome you to continue to visit this blog to look at our maps this summer, I would also like to draw your attention to our map gallery, where all past, current, and future maps will be on display. I'm still learning a lot about how Cabrini Connections works. Sometimes I get lost behind my mapping software and don't get to see what's happening in the trenches. Last Thursday, I had an opportunity to visit the troops. Each year at the end of the school year, Cabrini Connections puts on a dinner for everyone associated with the program. I had no idea what to expect, but was told I would meet volunteers and some of the parents, and that there would be some pretty good food served. What's more, I was going to get a chance to see some of the kids' artwork and performances. I've seen so much amazing artwork come out of here this year (an incredible documentary about the history of Cabrini, artwork they created for their gallery exhibit back in February.... and even a recently posted music video). Honestly I couldn't wait to see more. Well the food was definitely tasty, and I met some inspired volunteers. And the artwork, poetry, and performances were all top rate, as expected. But what really struck me was the emotion that spilled from parents, students, and volunteers throughout the evening. 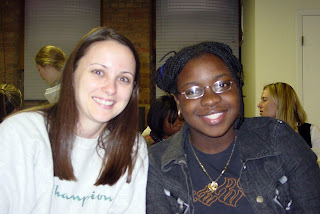 Again, Cabrini Connections operates like this: Students who live in the underserved Cabrini neighborhood are paired with volunteers from all over the city in tutor/mentor relationships. The tutors come from all walks of life and essentially - as one parent put it - "adopt" the kids... a committed partnership in which both parties learn and grow together. Cabrini Connections helps kids develop skills they otherwise couldn't develop. It helps them network with people they otherwise wouldn't meet. It ultimately prepares them to earn better grades and opportunities in life. I knew all this in theory. But I was still unprepared for the genuine emotion I experienced from the actual people. I saw seniors tearing up as they thanked volunteers who had "worked" side by side with them for years (many of these seniors are on their way to college)... Other students courageously took the microphone in front of 170 strangers and proudly recited incredibly personal and soul-wrenching poetry. 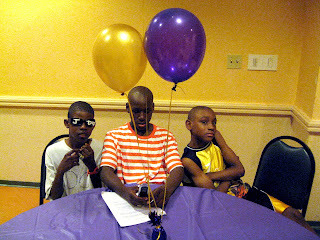 In the end, the kids exceeded my expectations. But he wasn't alone. There were others. Another woman limped to the stage on a cane, admitting that she thought she'd never see her daughter get C's on her report card. Her highest expectations were D's! But now she "has a child on the honor roll" thanks to the efforts of Cabrini Connections' volunteers. Personally, this doesn't really surprise me. During my experience working at a CPS High School the past 2 years, it became clear that many of the straight-F students in this city are frustratingly brilliant, but have clearly given up on school. They're lost in a life-long sea of ineffective schooling, and they now suffer from a lack of motivation, hope, and confidence. Many respond well to one-on-one tutoring - many are changed simply by meeting people who give a damn. So while so many talented kids drown in our underfunded schools (largely ensuring the perpetuation of poverty in our city), Cabrini Connections is fighting to motivate, encourage, and offer hope to students. Volunteers here are succeeding in prying open the hidden abilities of these otherwise neglected kids... while providing real experience and real opportunity. This IS all possible. I see it in the work these kids are producing, and I saw it in the faces of everyone at dinner the other night. This is very effective and very real. Now here's the thing. A lot of people don't think problems related to poverty affect them, and take an "out of sight, out of mind" approach to their daily grind. I'm prone to it myself, admittedly. It's human nature... survival, I think. As Cabrini Green and Robert Taylor and other impoverished neighborhoods gentrify, "blight" that used to inconvenience the sightlines from our seats on the brown and red lines disappears. 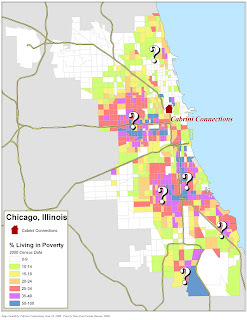 Some commuters might mistakenly believe that poverty in Chicago is "going away" too. But you know what? While the new census data in 2010 will likely show less poverty in the Cabrini neighborhood itself, don't be fooled - the kids are still here. What's more, take a look around the city... off your beaten track. There are other wastelands of poverty - each with brilliant kids who are rapidly giving up hope. Is anyone helping mentor and inspire these kids? 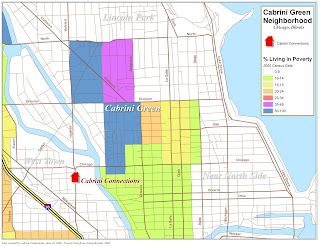 Here's the good news: There ARE programs like Cabrini Connections all over the city. Cabrini Connections serves a mere 73 teenagers. The program has about 90 volunteers. Imagine what would happen - the successes and tears that would be shared at end-of-year dinners around the city - the improved outlook for our city - if more people would sacrifice just a little time each week. Dan Bassill here talks often of this concept of "sacrifice." He points out that it's easy for Americans to applaud the sacrifices made by firemen and soldiers (and who in their right mind would not thank our firemen, cops, and soldiers for protecting and helping us?) Yet when it comes to championing our students, not many folks are throwing parades for teachers or tutors. And far too many of us have given up hope on inner city kids without having ever met them! The truth is that our future leaders in the business and political arenas are right here in our back yard. It's up to us to give them the encouragement and the guidance they need. 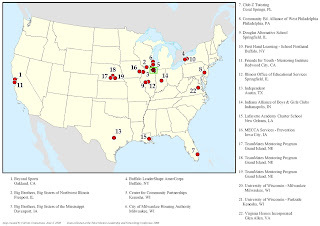 If you are interested in helping kids in your neighborhood, please use the Tutor/Mentor Connection's Program Locator to find a program near you, or contact Cabrini Connections for volunteer opportunities. If the emotions I saw Thursday are any indication, it could change the lives of students, families, and yourself. A couple times each year, Cabrini Connections and Tutor/Mentor Connection organize a local conference of folks who are involved or interested in tutoring and mentoring. With the goal of sharing resources and information, people come from all over the region and throughout the country. The most recent of these "Tutor/Mentor Leadership and Networking Conferences" occured at the end of last month, between May 29 and May 30. Overall, the conference was a great success, and I'm hoping these maps help coordinate future efforts of organizations who attended. Perhaps they even can help attract and help new programs who would like to share information and resources in tutoring and mentoring.